If you were looking for some friendly lighthearted competition you would have gotten into cage fighting. Instead you fish for walleye and musky. You don’t mamby-pamby around with bare-knuckles. You wage battle with one of St. Croix’s Legend Tournament® Walleye or Musky rods. 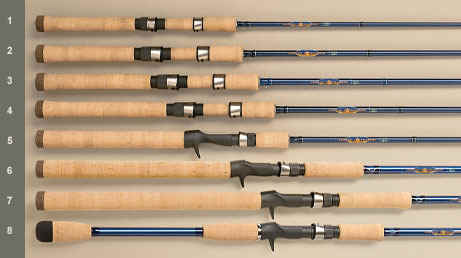 Following the incredible reception of the Tournament Bass split-grip handles, we’ve added seven split-grip Legend Tournament Musky rods in 2009. All of the Legend Tournaments offer a lethal combination of ART™ and IPC® technologies loaded into a SCIV blank making these the most sophisticated blend of light weight, casting power, brute strength and tournament-tough durability you’ll find anywhere. Fuji® Alconite® Concept Guide System with chrome frames. Fuji® ECS (walleye) or TCS (musky) reel seat/frosted silver hood on casting models. Fuji® SKM reel seat/frosted silver hoods on spinning models. Order from the table below. If you have any problems with our shopping cart, you may wish to use our online order form. Delivery is generally 3 to 7 days. View more details at St. Croix Rods. See the online brochure (PDF) at St. Croix. Email jollyann@cableone.net with any questions.